Ship named "Mavi Marmara" (Blue Marmara) is seen in Istanbul, Turkey, May 22, 2010. Turkey challenged Israel here on Saturday by dispatching the special ship named "Mavi Marmara" with 500 supporters and 20 million U.S. dollars worth of humanitarian goods to Gaza. (Xinhua Photo)A Turkish ship carrying supporters and aid materials left south Turkey's Mediterranean port city Antalya on Friday to join the largest international ship convoy to the Gaza Strip, which has seen more than three years of tight Israeli blockade, local media reported. 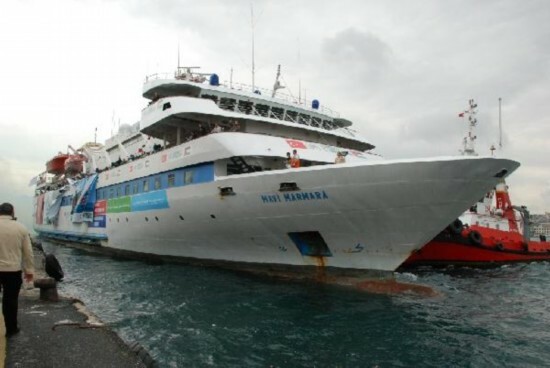 The ship "Mavi Marmara" (Blue Marmara) is expected to reach international waters to the south of Cyprus, where it will meet eight other aid ships, on Friday afternoon and arrive at the port of Gaza on Saturday, the semi-official Anatolia news agency reported. With 500 supporters and 20 million U.S. dollars worth of humanitarian goods onboard, the ship left Istanbul for Antalya last Saturday and will contribute to a total of 10,000 tons of aid goods carried by the whole flotilla. The campaign is supported by nearly 50 countries and thousands of NGOs and activists, and is organized by international organizations such as the "IHH Foundation for Human Rights and Freedoms and Humanitarian Relief" and "Free Gaza." Israel has announced that it will prevent the international ship envoy from reaching the territorial waters of the Gaza Strip, even by force. Israel has been imposing a blockade on the Gaza Strip since the Israeli soldier Gilad Shalit was kidnapped in 2006. However, Israel tightened the blockade and considered the Gaza Strip a hostile entity right after the Islamic Hamas movement seized control of the enclave by force in June 2007.